Image: Kevin Mazur/Getty Images for Parkwood Entertainment. Backup dancers or backup bodyguards? You be the judge. 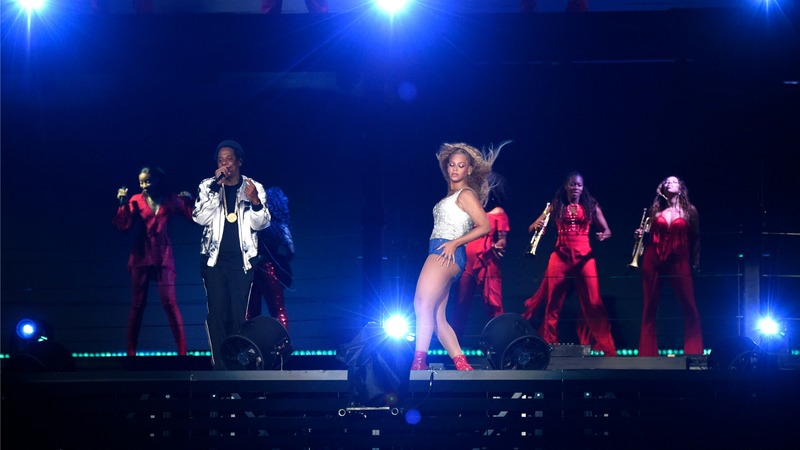 On Saturday night, an overzealous fan managed to get past floor-level security and storm the stage at Beyoncé and Jay-Z’s Atlanta concert. When the fan began chasing the couple offstage, security intercepted — but armed guards weren’t the only ones stepping up to save the day. Bey and Jay’s legion of loyal backup dancers quickly jumped into the fray to help restrain the stage-crasher. More: Beyoncé & Jay-Z Duped Us All on Tour With… Somebody Else's Twins? Let the irony not be lost on you that this occurred during Bey and Jay's On the Run II tour. While fans — many of whom posted videos of the incident from varying angles — were concerned about the Carters’ safety, Beyoncé’s spokeswoman revealed that they were unharmed. “Thank you to all the fans for your concern. They are fine and looking forward to the show tomorrow,” Yvette Noel-Schure wrote on Instagram. More: A Breakdown of the New Beyoncé Pregnancy Rumors — Could They Be True? The offending fan has since been identified by Atlanta police as Anthony Charles Thomas Maxwell, 26. According to USA Today, he was treated for minor injuries (presumably sustained in the scuffle) and issued a disorderly conduct citation. He was originally released at that point, although police have now tacked on a charge of simple battery. At least the Carters remain unharmed and able to continue bringing down the house. Bonus? They now know that their backup dancers are total badasses, too.